For this piece, I used a combination of transparent watercolor, gouache, matte and metallic acrylic, india ink, oil pastel, and liquid aluminum suspended in water on French Arches paper. The desired effect of the layering of materials is a dynamic multi-level space, exhibiting a combination of stasis and flux. As with most of my work, I seek to create a scaffolding of mostly linear elements that creates a natural resting place for the movement and interaction of the forms in the composition. The use of iridescent paint further elevates the forms into a heightened dialogue, given the natural change of effect with different lighting conditions. My goal of the dynamism of the forms on a scaffolding is to ignite wonder and bring the viewer inside the painting, and into a meditative, illuminated space. Hence the title, “The Gateway.” This piece was a platform for further exploration of my visual vocabulary, with a combination of marks that suggest stepping stones and ladders, dendrites and neural synapses, and vines and botany. This language suggests growth and change of space and form. 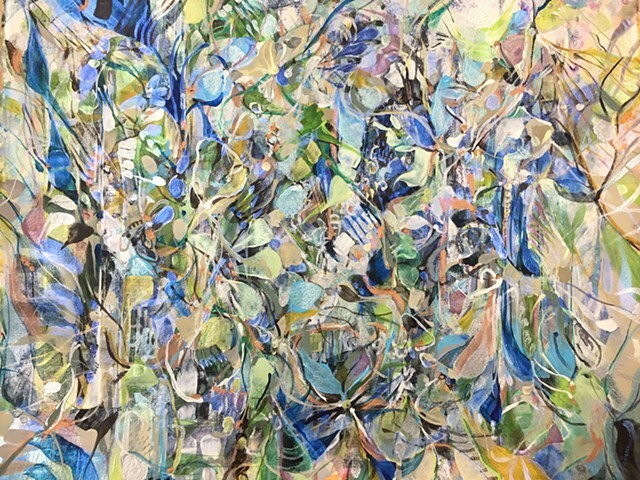 Visual references for this painting included architecture of Parisian rooftops, images of neural networks during meditation, and natural, botanical forms. It is the immediate successor to my oil painting, “Zycie Jest Piekne, (Life is Beautiful)”, and was undeniably influenced by the dialogue set in motion within that painting.